This huge shift in weather has brought buyers out in droves! May closed sales reached the highest numbers since 2006. But, as the Washington Post noted, that’s only part of the story of this market. Prices overall are actually either staying flat or declining slightly despite the increase in demand and low inventory. Though that is just on average. On the front lines we are still seeing multiple offers in a few hot areas, but other neighborhoods are seeing closer to list price while competing more on the terms of the offer. But homes are still selling fast. Half of the houses in the area sold in less than 14 days last month. We expect some market upheaval as the election gets closer, and now with news of Brexit, there’s speculation that interest rates could drop EVEN LOWER! Not sure if this is the right time for you to buy? Contact us for a quick, no obligation conversation or attend one of our classes! Attention Home Sellers: Are you or someone you know thinking of selling in the next 12 months? We’re hosting a free Home Seller’s class onTuesday, July 26 at our McLean office. We’ll be discussing market stats and outlook, which upgrades and repairs make sense, staging tips, and a process overview. You can register using this link! Home Buyers: We haven’t forgotten you! We’re starting up our free home buyer classes again, with the next one scheduled for Thursday, July 14 in Virginia Square. Register here. 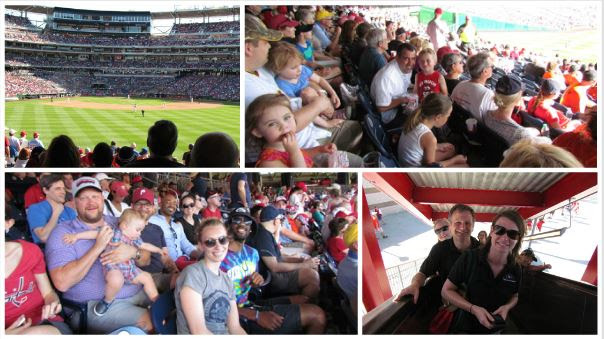 Client Appreciation Event: This month we headed to the ballpark and had a great time with over 100 clients and friends who joined us Sunday, June 12th to watch the Nats beat the Phillies in a nail-biting finish. With the Nats down by 1, bases loaded, and 2 outs, Jayson Werth hit a well-placed single to bring home Bryce Harper (pinch hitting) and Danny Espinosa to win.Thanks to all our clients and friends who referred clients to us — our business depends on you! If we can help you or someone you know with your real estate needs, please do reach out. We always love to hear from you! This entry was posted in Arlington real estate, community events, DC real estate, Market Updates, Northern Virginia Real Estate, real estate news, This Month in Real Estate, Washington. Bookmark the permalink.